The Cavanaugh Law Firm writes, edits, and publishes The Job Description, an employment law newsletter devoted to employment issues and other matters of interest to our clients. The newsletter is offered at no charge to clients and friends of the firm and is designed to highlight current events in employment law and to acquaint our clients and friends with updated legal concepts and principles. Past issues are made available with the understanding that they are not offered as specific legal advice, and that the facts and opinions included within may be, or may become outdated with the passage of time. What May You Ask an Employee who Calls in Sick? 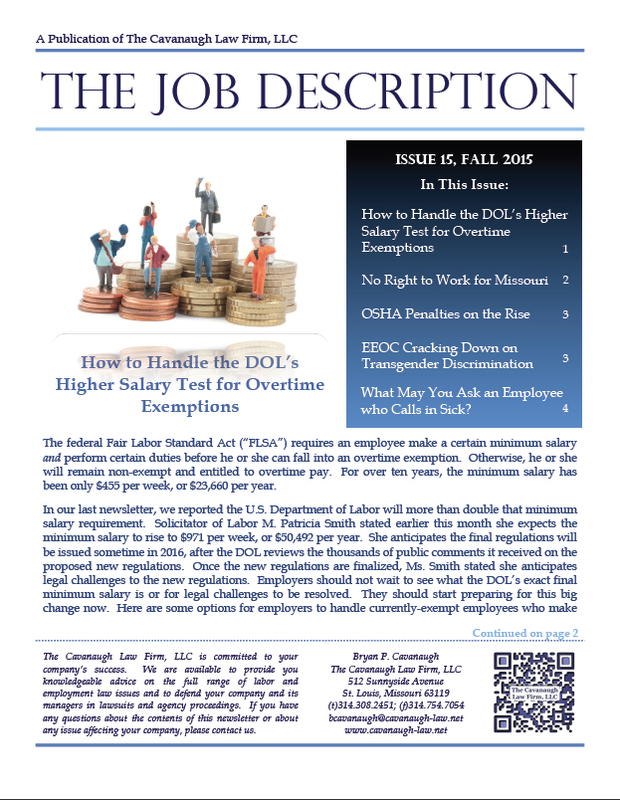 What Did the EEOC Do In 2014? Are You Subject to Health Care Reform’s Employer Mandate? Can an Employer Force an Employee to Go Home Sick? Using Interns: is it Legal? Update on the "Facebook Case"